Today we spent most of the day well below sea level. We loaded up the bus this morning and headed toward the Dead Sea. We soon entered the Wilderness of Judea and saw many interesting rock formations and many Bedouin encampments. 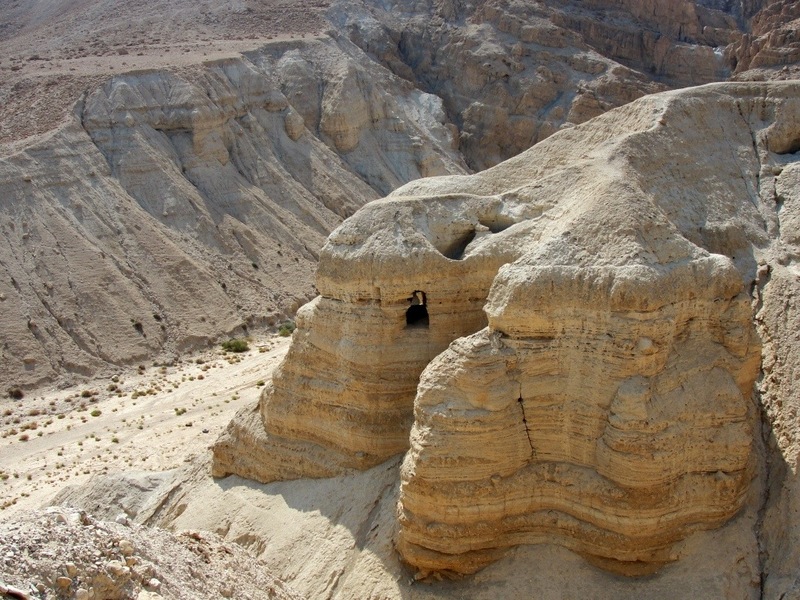 Several interesting events took place in the Wilderness of Judea. It is the setting of the story of the Good Samaritan, John the Baptist preached there and it was also where Jesus was tempted. Our first stop of the day was a surprise as it was not on our schedule. 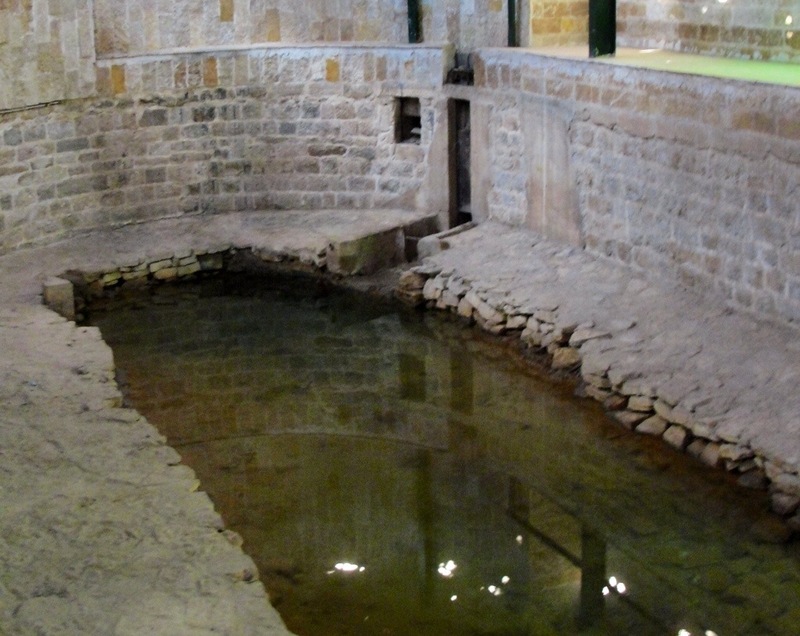 This is the traditional location for the baptism of Jesus by John the Baptist. 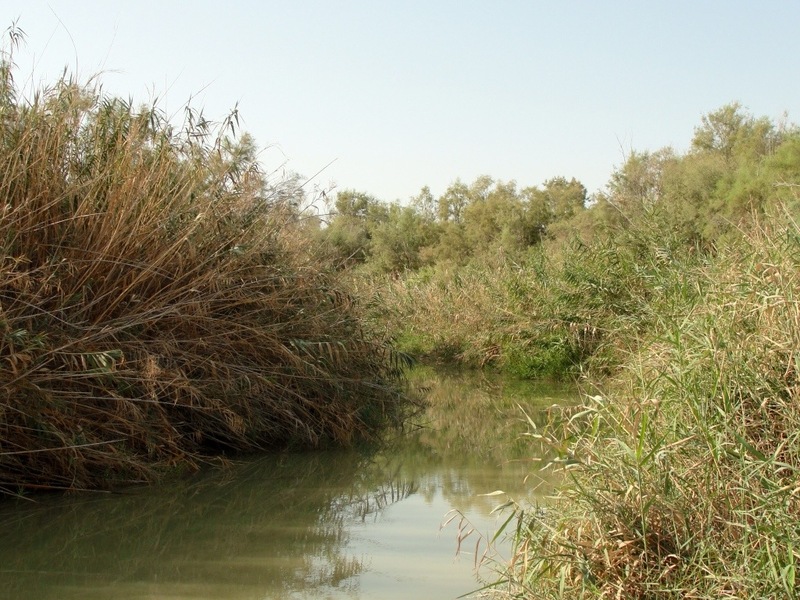 Across the Jordan River from us was Bethany beyond Jordan. The side of the river we were on is less developed than the Jordan side of river. The baptism may not have happened exactly where this picture was taken, but it is representative of where it happened. We then loaded back on the bus and headed toward the Dead Sea. The picture here was taken at the north end of the Dead Sea. This is the lowest point on Earth. I have seen several different numbers for the elevation, so I think it will be best to just say that it is almost 1400 feet below sea level. The level of the Dead Sea has been rapidly dropping due to increased use of water that would normally flow down the Jordan River. After a scenic drive with hills to the right and the sea to the left, we arrived at our next stop. I will not recount the story of Masada here, as many of you will already know it. Seeing the site for the first time was impressive as I was able to see the sheer size of the fortress. 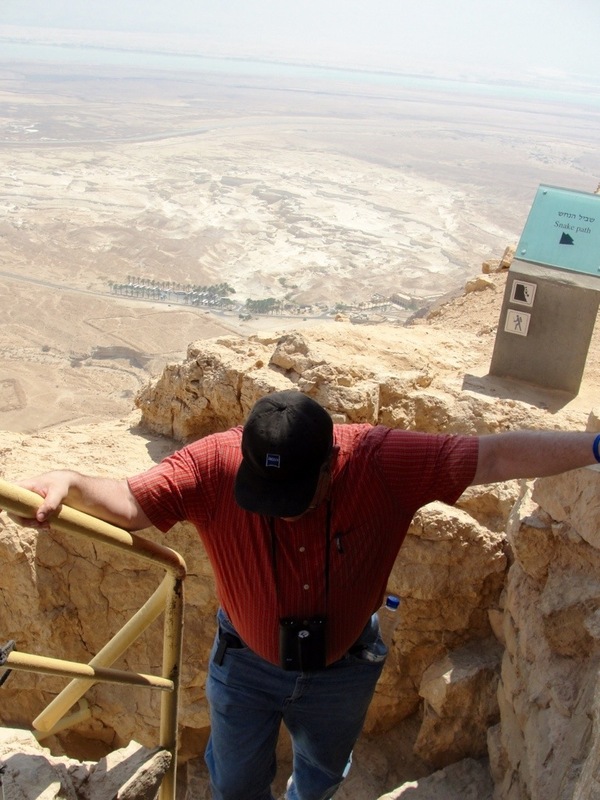 To reach the top of Masada, you have several choices. Most of our tour members opted to ride the cable cars up to the top. I joined a smaller group that wanted to follow the Snake Path to the top. You can see the Snake Path in the picture above. 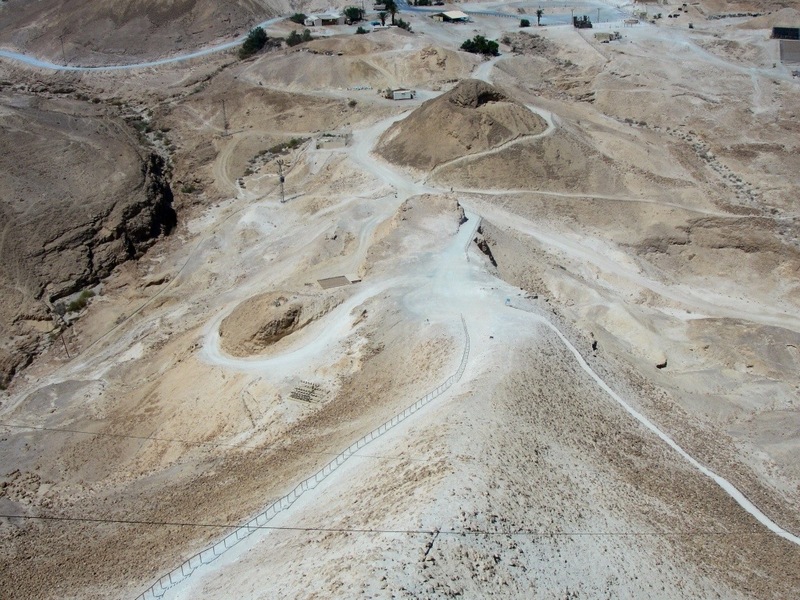 The path goes up the side of Masada with a vertical rise of about 400 meters. About 45 minutes after we started, I reached the top. Here I am climbing the last few steps. It was an arduous climb and in the upper portion I made many rest stops. However, it was a rewarding climb. It gave me a feeling for how unassailable the fortress was. Another of the ways to access the site is to walk up the ramp that was built by the Romans when they besieged Masada in 73. I can just imagine the work that had to be done to build the ramp, and the astonishment of the Romans when they entered Masada the morning after they breached the gate. The fortress was fascinating, and hopefully I will be able to visit it again some day. Next time I will take the cable car:-). I did take the cable car back down to the visitor’s center. We then headed toward Ein Ghedi, only to find out that the restaurant that we planned to eat at was closed for restoration. Since this was the spot where we planned on walking on the shore of the Dead Sea, we missed our opportunity. 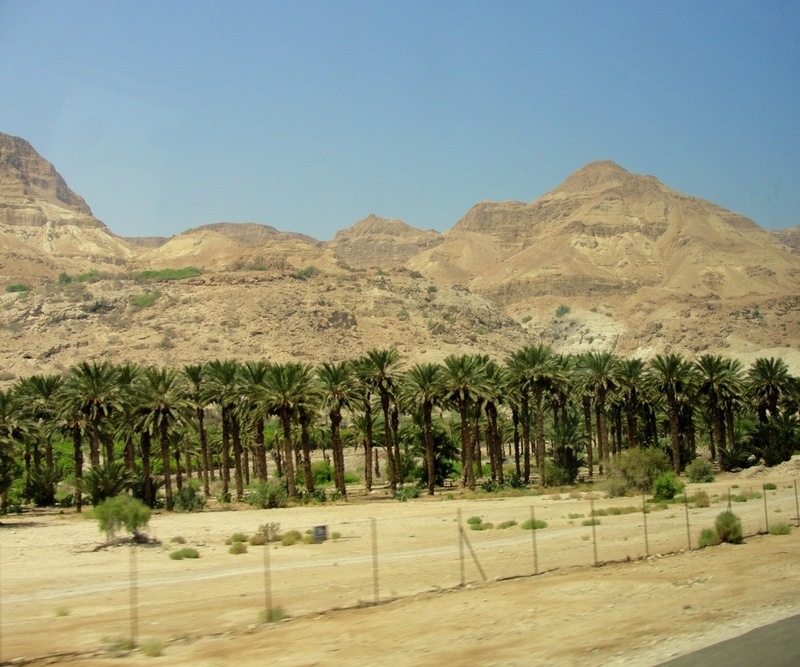 The picture above is one of the Date Palm groves with the hills above them. I did see an Ibex right as we were pulling back on the highway from Ein Ghedi, but was unable to get a clear picture. We then headed on up to Qumran for lunch and a tour of the excavations there. On the way we were able to look across the Dead Sea and see Mount Nebo in the distance. After a good lunch we watched a short film in the interpretive center and saw a few exhibits before once again braving the heat of the day. The picture above shows one of the entrances to Cave 4. This cave is the most famous of the 11 caves as more than 15,000 fragments and more than 100 scrolls were found here. We then headed up to Jericho. The tell of Jericho is named Tell es-Sultan. There have been many excavations here and many disagreements over the interpretation of what has been found. The picture here shows a Neolithic Tower that is considered the oldest building in the world. The tower is 3.6 meters tall and is connected to a wall from the same time period. Across the street from the tell is Elisha’s Spring. The spring is still producing water today. This happens just before one of my favorite accounts of Elisha. After an exhausting day, it was nice to head back to the hotel. We will be up early tomorrow as we will start another day of exploration in the old city of Jerusalem. For more information about the trip you can also read the following blogs by other tour members. 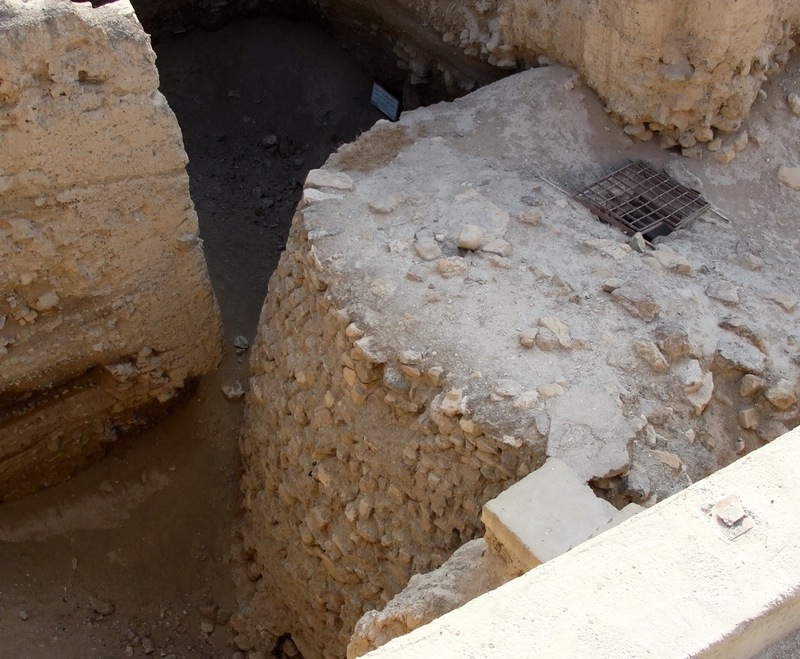 This entry was posted in Israel, Travel and tagged archaeology, baptism of jesus, Dead Sea, Israel, Jericho, Masada, Qumran, travel, vacation. Bookmark the permalink. I love the photo of the caves. Great post – thank you! Such an amazing trip! What will they do when the water runs out? That is a good question. There is a lot of discussion about what to do. A lot of it heated. There is such a demand for water in the area and that is the primary reason for the drop in the level. I worry about this all over the world. We’re somewhat lucky in Canada living near the Rockies, they produce a far amount of fresh water in the spring. We have to start being more conscious of it. It’s one reason I’ll never to golfing in the desert…in my humble opinion, growing grass in the desert a colossal waste of a limited resource. Steven, I hope you know how much pleasure you are giving us through your pictures and comments. Thanks!!! How cool to walk up the Masada, well, I imagine it was pretty warm! 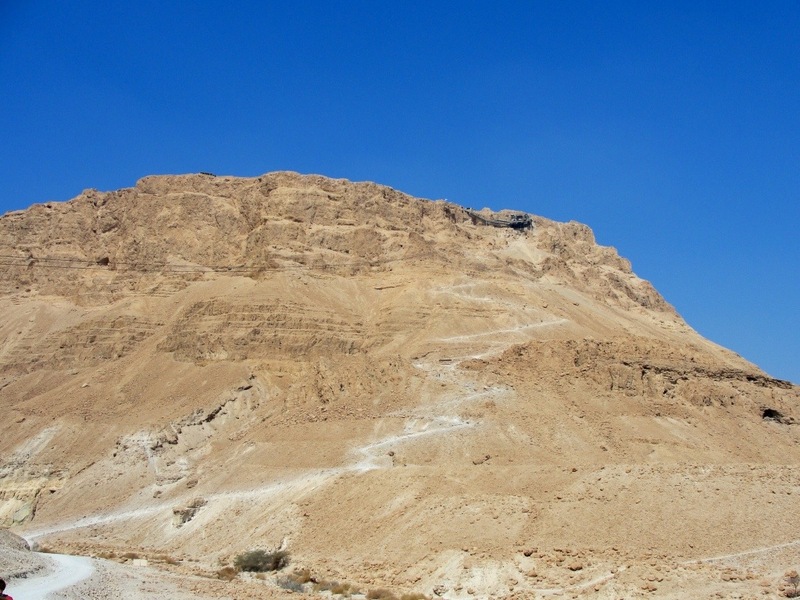 I have walked down the Masada a couple of times but never have had enough time to walk up, that’s on my bucket list. I enjoyed your Jericho post…. I was just recently there and enjoyed the trip very much. We did not see the Tel es -Sultan that you mentioned as having the ruins of the old walls of Jericho. Where is this located? Hi Steven — Where is the Tel es-Sultan? When I was there recently, we missed seeing the old Jericho walls that fell down. Tel es-Sultan is on the west side of modern day Jericho. It is easy to find as there are many signs pointing the way.